Grenadiers a Cheval ride the largest and strongest steeds. Although relatively slow, their charge into an enemy is almost certain to do terrible damage. Once in close combat, the grenadiers are strong enough to continue the slaughter. They may meet their match charging against infantry in square, or in a fight with well-disciplined elite infantry but, even then, they embrace death with the same resolve they display in attack. To modern eyes, the concept of a mounted grenadier looks more than a little odd: surely the horses would panic at the first grenade explosion? 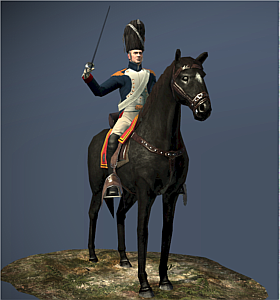 Like all other grenadiers, the Grenadiers a Cheval were large men, chosen for their physical qualities. To be admitted to the grenadiers, a man had to been cited for bravery, have several campaigns under his belt, and be a strapping fellow. Mounted on large black horses, and resplendent in their bearskins, they made for an intimidating presence and were nicknamed ‘The Giants’ or ‘The Gods’ by their fellow Frenchmen.